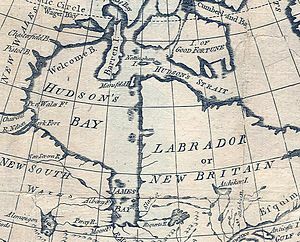 The Hudson Bay expedition of Jean-François de Galaup, comte de La Pérouse was a series of military raids on the lucrative fur trading posts and fortifications of the Hudson’s Bay Company on the shores of Hudson Bay by a squadron of the French Royal Navy. Setting sail from Cap-Français in 1782, the expedition was part of a global naval war between France and Great Britain during the American Revolutionary War. Operating under secret orders from the Marquis de Castries, France’s marine minister, La Pérouse sailed from Cap-Français in May 1782, and arrived before the Prince of Wales Fort in early August. 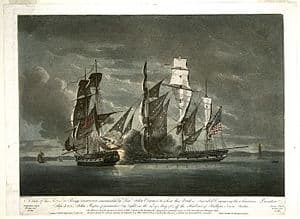 That fort and York Factory both surrendered without a fight, although some of the stored furs at York were spirited away by a company ship that evaded the French fleet. Many of the British prisoners were put on a sloop which they sailed back to England. Men on La Pérouse’s fleet, which had sailed with minimal winter provisioning to maintain secrecy, suffered from scurvy and other diseases because of their hardships. The Hudson’s Bay Company finances suffered because of the raid, and it contributed to reductions in the native population that did business with the company. Jean-François de Galaup, comte de La Pérouse, a captain in the French Navy, first proposed the idea of an expedition against the fur trading posts of the Hudson’s Bay Company to Charles Pierre Claret de Fleurieu, the French minister of ports, during a visit to France in late 1780. France’s marine minister, the Marquis de Castries, and King Louis XVI approved the plan, and Castries issued La Pérouse secret orders that could override those of any fleet commander La Pérouse served under in the event an opportunity presented itself for such an expedition. The idea was to organize a small fleet in secret and make as rapid as possible a journey north to Hudson Bay from either Newport, Rhode Island or Boston, Massachusetts, the most northerly ports of North America open to French ships. La Pérouse’s duties during the 1781 campaign season did not provide him with any chances to exercise his secret orders, but the aftermath of the disastrous French loss in the April 1782 Battle of the Saintes presented him with the opportunity. 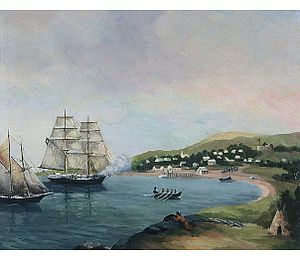 France and Spain had been planning an assault on Jamaica, but the losses incurred during the battle, including the capture of Admiral Paul, Comte de Grasse and his flagship Ville de Paris, led them to call off the expedition. La Pérouse, on his arrival at Cap-Français after the battle, raised the idea with de Grasse’s successor, Louis-Philippe de Vaudreuil. Vaudreuil approved of the plan, and provided La Pérouse with three ships: a ship of the line Sceptre (74 guns), and the frigates Astrée (38) and Engageante (34). Astrée was under the command of Paul Antoine Fleuriot de Langle, and Engageante was led by Lieutenant André Charles de la Jaille. Preparations for the expedition were carried out secretly and in some haste, since the French were aware of the short season in the far north. The ships’ crews and most of their officers were not informed of the fleet’s destination, and La Pérouse, seeking to avoid all suspicion, even avoided carrying cold-weather clothing. Admiral Vaudreuil recorded the fleet’s destination in his records as France, with possible stops in Newport or Boston, and Langle and la Jaille were given sealed orders to be opened only upon reaching the latitude of Nova Scotia. The fleet took on 250 regular infantry from the Régiment Auxerrois, 40 gunners, 4 field guns, and two mortars. These troops were told they were being sent to supplement the French army at Newport. After two weeks of preparation, the fleet sailed from Cap-Français on May 31, 1782. The fleet reached Resolution Island at the entrance to the Hudson Strait without incident on July 17, and proceeded through the strait and into Hudson Bay. While sailing in the bay, the fleet encountered the company ship Seahorse, which was making sail for Fort Prince of Wales. La Pérouse sent one of the frigates to chase after her. Seahorse’s captain, William Cristopher, suspecting from its behavior that the French ship lacked good charts for the bay, escaped by a ruse. He gave orders to have his sails furled as if he was preparing to anchor; this prompted the French captain, believing shallow waters to lie ahead, to actually drop his anchor. Once he had done so, Cristopher raised his sails and sped off before the Frenchman could raise the anchor again. On August 8 La Pérouse arrived at Fort Prince of Wales, an impressive but crumbling stone fortress that was defended by 39 civilians. 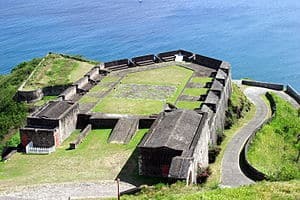 Its governor, Samuel Hearne, surrendered the fort without firing a shot when the size of the French force became evident the next day. He did so despite requests from some of his men to “allow them to mow down the French troops with the heavy guns loaded with grapeshot”. After resupplying his ships and confiscating the fort’s guns, the French proceeded to loot the premises. According to Hearne, the French took more than 7,500 beaver skins, 4,000 marten pelts, and 17,000 goose quills. They also spent two days trying to destroy the fort, but were only able to destroy the gun mounts and damage the upper ramparts. Many of the prisoners were put aboard the company sloop Severn, which had been anchored by the fort; others were taken aboard the French ships, and some were even incorporated into the crews. La Pérouse then collected most of the company’s small boats, and sailed for York Factory, a company outpost on a peninsula between the Hayes and Nelson Rivers, on August 11. According to Pérouse’s report, he arrived in the area, about 5 leagues (15 miles; 24 km) from York, on August 20. The fort’s defenses faced the Hayes River, where the company ship King George was anchored, and the fast-flowing Hayes River would have made an approach there impractical in the face of that opposition. La Pérouse sailed into the mouth of the Nelson, and moved the troops to the smaller company ships on August 21 to prepare for an amphibious landing, with the plan of approaching the fort from the rear, a distance of about 16 miles (26 km). He then proceeded with his engineer to take soundings in the Nelson River, and discovered that even the smaller boats would have difficulty approaching proper land due to its shallowness. His small boat then became mired in mud by the receding tide, and did not become freed until 3 am the next morning. Captain Langle then proposed to Major Rostaing, the commander of the troops, that they cross the muddy shallows on foot. He was agreeable, and the troops then set out to across the shallows. Unknown to them, conditions improved only marginally once land was reached, and they spent the next two days wading through bogs and muck to reach the fort. While they did this, La Pérouse returned to the fleet, because bad weather was threatening the safety of the fleet. Both frigates lost their anchors when sharp rocks underwater cut through their cables in the turbulent conditions. La Pérouse did not learn of the capitulation until August 26, and continuing bad weather and difficulties with the frigates meant that he did not effect a junction with Rostaing until August 31. The terms of capitulation included the surrender of Fort Severn, another small outpost. He chose not to actually go to Fort Severn on account of the lateness of the season and the poor condition of his ships and men, who were suffering from scurvy and other maladies. During the process of loading goods and supplies onto the fleet, five small boats overturned and 15 men drowned. La Pérouse then began the journey back to the Atlantic, towing the Severn as far as Cape Resolution. There she was cut loose to make her way back to England, while La Pérouse sailed for Cadiz with Sceptre and Engageante; Astrée made sail for Brest to deliver news of the expedition’s success to Paris. The expedition took a tremendous toll on his ships’ crews. By the time the ships returned to Europe, Sceptre had only 60 men (out of an original complement, including land troops, of almost 500) fit to work; about 70 men died of scurvy. Engageante had suffered 15 deaths from scurvy, and almost everyone was sick with one malady or another. Both ships had also suffered damage due to cold weather and battering by ice floes. Fleuriot de Langle received a brevet promotion to capitaine de vaisseau upon his arrival in Brest in late October. According to the company, the goods taken at Prince of Wales alone were worth more than £14,000, and La Pérouse’s raid so damaged the company finances that it paid no dividends until 1786. When peace finally came with the 1783 Treaty of Paris, the French agreed to compensate the company for its losses. The raid did permanent damage to the company’s trading relationships. The Chipewyans who traded with the company suffered severely due to the company’s inability to provision them, and by an ongoing smallpox epidemic that was ravaging Indian populations throughout North America; the Chipewyans lost half their population by some estimates. The company’s inability to trade with them for two season drove many survivors to develop trading relationships with Montreal. Neither Hearne nor Marten was sanctioned by the company for surrendering; both returned to their posts the following year. When the French took Fort Prince of Wales, they found Samuel Hearne’s journal, which La Pérouse claimed as a prize. The journal contained Hearne’s accounts of his explorations of the northern reaches of North America. Hearne pleaded with La Pérouse for its return, a request the latter granted on condition that it be published. Whether Hearne had intended to publish it anyway is unclear, but by 1792, the year of Hearne’s death, he had prepared a manuscript, and submitted it for publication. It was published in 1795 as A Journey from Prince of Wale’s Fort in Hudson’s Bay to the Northern Ocean. La Pérouse was rewarded by King Louis with a rise in pay of 800 livres; the exploit drew also drew popular acclaim in Europe and North America. His next major assignment was to lead a voyage of exploration into the Pacific Ocean in 1785. His fleet, in which Fleuriot de Langle served as second in command, was last seen in the vicinity of Australia in spring 1788; although remnants of the expedition have been found, his fate is unknown.